Have you ever made the mistake of swapping shipping labels? You’ve printed your labels, you’ve boxed your items and then you accidentally put label A on package B and vice versa? Ugh! 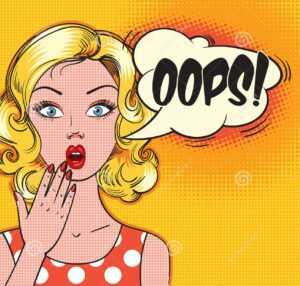 Yes, it happens to all of us. Having my listed inventory stored three hours away and relying on a super awesome and very dependable and reliable teenager (with some backup help from her younger sister and mom) has, for the most part, gone smoothly. In the four months or so we’ve been doing this, there have been a few hiccups and those have usually been when a label gets swapped. Nothing earth shattering but it did leave a few customers with an understandably unsatisfactory experience. Because I’m a firm believe in revisiting your processes often and continually refining them, I sat down last weekend and figured out a way to reduce (and hopefully eliminate) swapping labels on packages. Right now my process involves me sending Sydnee an email with a screen shot of my items waiting to be shipped page. I use this screen shot because it shows the custom label field where I’ve included the location of my inventory. Until eBay Mobile adds the custom field to our sales data, this is the best way I’ve figured out to do this. I also like that it gives her a picture of them item, I just wish the photos were larger and easier to see. Sydnee packages everything up, weighs them and then texts me the info. I was processing the labels one-at-a-time via eBay because that option allowed me to save them as a pdf to email to her. This was too time consuming and I wanted to test out other ways to see if I could find one that was faster, easier and was just better in order for us not to get the labels mixed up…and I found it! I feel like I hit the jackpot and you will too! Many sellers ship their items one at a time to prevent label swapping from happening. Unfortunately, it still happens. 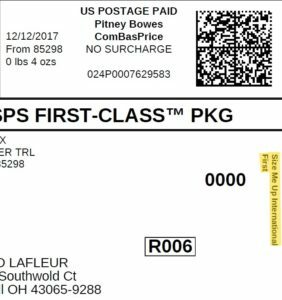 When I was shipping my inventory myself I loved using Stamps dot com to ship because Stamps allowed me to type in a note that would print at the bottom of the label. I’d use this as a short hand for whatever I was shipping that day, trying to keep it generic enough that anyone looking at the package wouldn’t know what was in it. If I was shipping an American Girl item I’d type AG. For a long time I bought “thank you for your business” stickers with the sole purpose of covering up whatever I typed in that space. 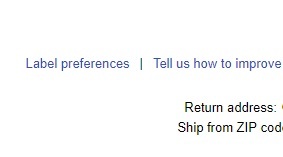 Because I did this, I never paid attention to who or where an item was being shipped. This worked great until I had to email my labels. Stamps dot com doesn’t have a print to pdf option so I found myself using stamps for the labels I was shipping and eBay for the ones Sydnee shipped…talk about the opposite of streamlining a process! 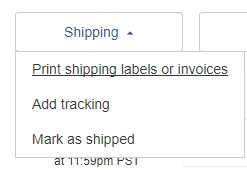 SIDE NOTE: I have since learned that this option isn’t available on MY stamps account because I am using the free version that comes with an eBay store. If you want to print to pdf you can do it from the stamps dot com website. I’ve got the program downloaded on my computer and that’s what I use…that one doesn’t have the pdf option. So here’s the part where I CHANGE YOUR WORLD! 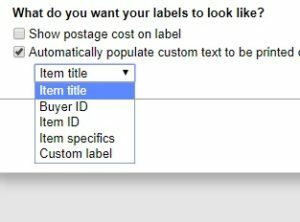 eBay has the OPTION to print the item title, custom label, sku or buyer ID right there on each and every label…..Wuuaaaahhht!? Yes, that’s right. Check it out. Look! There it is, right there on the right side of the label, in tiny print so you only see it if you know it’s there. I LOVE THAT! Because I have the option to print my TITLE, it prints the first 30 characters. Because this is helping Sydnee pull inventory, I’m going to keep this in mind when listing going forward. I want her to know what item the label is for when she’s shipping. How AWESOME is that!? No more writing the buyers name on the package. No printing one label at a time. No more mornings spent shipping a handful of items. This feature is going to ROCK YOUR WORLD! This is easily done when you bulk print your labels. You have to set this up when you have TWO OR MORE labels to print, but once it’s set up, you can print one label or ten. 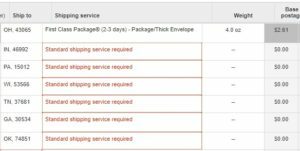 from your seller hub, go to MANAGE ORDERS AWAITING SHIPMENT page and click the ACTIONS box at the top of the left hand column. This will select all your items to be shipped to day. 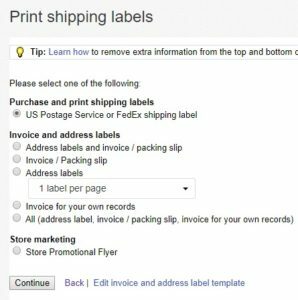 Keep the default setting of Purchase and print shipping labels selected and click on CONTINUE at the bottom of the window. Under “What do you want your labels to look like?” Click on AUTOMATICALLY POPULATE CUSTOM TEXT TO BE PRINTED ON LABEL. From the drop down menu select what you want printed on your label. Your choices are ITEM TITLE, BUYER ID, ITEM ID, ITEM SPECIFICS or CUSTOM LABEL. I selected ITEM TITLE for my labels to make it easier for Sydnee to match the label with the packages. Some find the CUSTOM LABEL helpful. If you’ve got a large number of listed items, this might be helpful in pulling your inventory. NOTE: Only the first 30 characters will print so you may want to keep this in mind when setting up your titles and/or custom fields. You label will print with the info from that data you selected in #6 on the label. On the right side, printed small and sideways. Hopefully inconspicuous enough so your buyer doesn’t notice.